The Larson Electronics WAL-SL-10-LED-12.4-TWP-277V Temporary Tunnel LED Lighting String Light System is designed for high output illumination and daisy chain connections across a total length of 100` away from the power source. The 10 watt LED lamps on this this work site light set provide more and higher quality light than 100 wattage incandescent lights while creating less heat and using less power. This LED light stringer operates on 277V AC and provides operators with a temporary work light solution for tunnels and underpasses. This temporary tunnel string light consists of 10 industrial grade LED lamps with 10` of 12/4 SJTW cable between each unit, stretching a total of 100` in length. This temporary LED string light is connected to a 277V power source via an integrated 3` line-in cable terminated in a L22-20P cord cap. 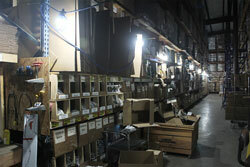 Each globe light is equipped with a high output LED bulb which delivers more light output than a 100 watt incandescent. The 10 watt LED bulb draws 10% the electrical power of a standard 100 watt bulb, making it suitable for standard voltage and low voltage applications. 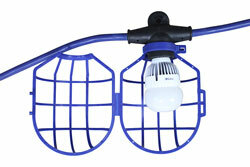 Each LED light screws into a molded E26 lamp socket and the bulb is enclosed in a bird cage style plastic guard. Ten high output A19 style LED lamps producing 1050 lumens per lamp provide a total of 10,500 lumens of bright white illumination. Each lamp housing is constructed from light weight aluminum, and fitted with an impact and shatter resistant polycarbonate diffuser. These LED light bulbs provide additional safety measures and time savings, given the low heat production and that it does not require replacing for 50,000 hours. Since the LED bulb uses solid state technology, the vibration (dropping, etc.) that degrades conventional incandescent bulbs is not an issue with these LED bulbs. Unlike the glass tube design of traditional fluorescent lamps, these LED T-Style lamps have no filaments or fragile housings to break during operation. Instead of using a combination of gases to produce light, light emitting diodes (LEDs) use semi-conductive materials that illuminate when electric current applied and emitting light. The LED assembly is mounted to the extruded aluminum, with a polycarbonate lens protecting the LEDs. With LED lights, there is no warm up time or cool down time before re-striking and provide instant illumination when powered on, adding to the reliability of LED technology. By nature, LED light sources run significantly cooler than fluorescent lamps, reducing the chance of accidental burns and increased temperatures due to heat emissions. This solid state design of light emitting diodes provides a more reliable, stable, durable, and energy efficient light source over traditional fluorescent lighting. 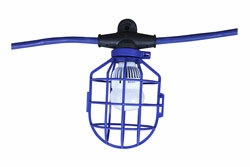 Each light has a plastic mesh guard enclosure that provides protection for the enclosed bulb and a hook eyelet that allows operators to hang these tasks lights overhead. Utilizing energy efficient LED lamps, operators are able to provide more light coverage from the same amp draw, or lower the amp draw using the same amount LED lamps as incandescent. 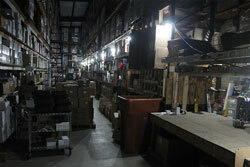 Each LED trouble light has an effective range that approximately covers a 5-8` radius with 10-15 foot candles of light. Unlike fragile incandescent and compact fluorescent lamps that are made from glass, these LED bulbs are extremely durable and can live up to the abuse of harsh working conditions. With a lamp life of 50,000 hours, operators are not constantly having to replace burnt out or broken lamps, reducing down time and lowering the amount of spare lamps required at the job site. Each LED string light assembly has the potential to $12,000* per year in electricity alone, not including maintenance costs, operational downtime, reduced productivity, HVAC loads, or carbon footprint. This results in short return on investment (ROI) timeframes. *Assumes operating for 12 hours a day, 7 days a week, at $0.12/kWh. 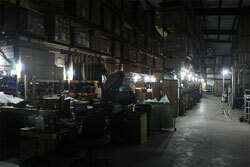 Comparison made between 100 watt incandescent rough service lamps and LED lamps. Energy savings will vary depending on operatioal time, energy rate, and lamps outfitted in alternative fixtures compared to the LED string light. Please note: This string light is not capable of supporting 100 watt lamps nor 26 watt lamps due to cable restriction and overloading the cable. These comparison charts are for references only. To be able to achieve the same results with traditional light sources, higher amp capacity cable would be required or shorter runs per string light assembly. To be able to achieve the same distance, multiple power sources would be required for the total length of the area that requires being illuminated. The LED string lights from Larson Electronics have been designed to overcome the above difficulties and faults with traditional lighting. This allows operators to run a single strand of string lights within the work area and span long distances from a single power source and work around voltage drop without sacrificing light output. This feat would not be possible with above traditional light sources without increasing cable size, weight of the unit, number of power sources required to span the same distance, while providing more light output within the work space. These LED lamps are suitable for wet areas, extremely long lived, resistant to damage from impacts and vibrations, and consume far less energy than standard lamps. This tunnel string light is configured to operate with 277 volt electrical current. Alternative voltage options are availabe. Each section is equipped with a L22-20P male and L22-20C female cord cap. The LED lamps provide more and better quality illumination than 100 watt incandescent string lights without the high heat and fragile glass construction of traditional lamps. 2. 10 Lamps for a total of 100 watts spanning 100` in length. 3. 1,050 lumens per lamp for a total of 10,500 lumens. 4. High output LED lamps provide bright white illumination and better color rendering compared to the dingy yellow tint of traditional incandescent lamps. 9. Durable solid state LED construction resists damage from impacts and vibrations. 10. Hanging hook for hanging and hands free operation. 11. 10` of 12/4 SJTW cable between each light. 12. 100` span of temporary LED work lighting. 13. 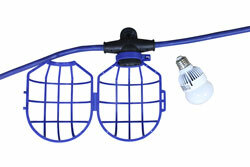 Energy efficient alternative to incandescent and compact fluorescent temporary string lights.